White House officials today released a document recovered from the crash site of a suspected UFO in the Roswell area of New Mexico, July 1947. Until this morning, this document had been classified as Top Secret and remained un-translatable until 1981 when the processing-power of the mighty Sinclair ZX Spectrum was put to work. After several decades of decryption the twenty page document was found to read as “R Tape loading error, 0:1” However, recent work has expanded on this and here, thanks to the Freedom of Information Act, the fully-transcribed document is available to the public for the first time. Coming to your home town soon. Alien high-command on planet Taito came up with a plan of breath-taking simplicity that, had the invasion ever taken place, could surely not have failed. The invasion would focus on a single city of world importance, New York (or Tampa if the weather was cold). Each wave of invading space craft would consist of 48 UFOs in six ranks of eight. These six ranks would move from east to west across the sky-line of New York (or Tampa) dropping a variety of weaponry on the helpless city below. When the city-limit was reached, the occupation fleet would edge closer to the planetary surface and move from west to east, adding to the destruction. Eventually, the alien force would land and scuttle along the surface of the city in an easterly direction, eliminating any remaining resistance and buildings. It was assumed that Earth would then surrender, although Taito high-command were prepared, if necessary, to repeat the destruction over Moscow, London, Tokyo and Paris – especially Paris. But are we safe now? The true identity of the King of Taito is uncertain, though his image was on every surface in the alien craft. Sociologists have suggested that only a powerful cult of personality could cause Taito’s troops to undertake such a risky attack, and it is thought that the King (nick named Donkey Kong by researchers for reasons lost in time) may have died before the invasion fleet got under way. The threat to Earth. From left to right: Command and Control craft, Jellyfish, Munchkin, Zoidberg. 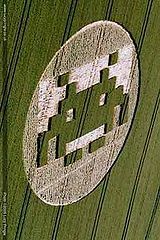 Does this recent crop circle in Wiltshire suggest renewed alien invasion threat? Or does it look like a Trocadero album cover? So far Earth has been lucky, in the sixty years since the Roswell incident we have suffered no major alien incursions, but just how well prepared are we to meet the threat should it be renewed? Major-General Winchester told reporters that every effort had been made to ensure that the United States and its allies would be able to defend themselves. "A wiser man than me once said 'the best form of Defence is Offence' - I think it may have been Hitler. With that in mind, ladies and gentlemen, in addition to the four force-field shields for every major city the Defence Department has procured the latest in laser-tanks at a cost $40 million each. These tanks are capable of tracking the invasion force both East-West and West-East, and firing up to forty rounds a minute to an altitude of twenty thousand feet." "Should the alien fire become too much, the tanks are designed to be able to hide beneath the force shield and to blast a loop-hole through them, to continue their offensive strategy. We figure three laser-tanks per city should be enough." "Once all forty eight alien craft have been destroyed we're kinda hoping they'll just go away. But, in case they don't, we have been stock-piling quarters in all metropolitan areas since 1955." A spokesman for the Red Army denied that Russia was unprepared for the threat to Moscow and St Petersburg. "Da, we heard all about in 1994 from mole at White House - Hilary someone. Our experts looked at threat, our experts better than your experts. Our experts noticed invasion planned in two dimensions only; Russia will send missiles from North and South of cities and explode space-monsters from in front and behind." This page was last edited on 5 June 2012, at 05:12.